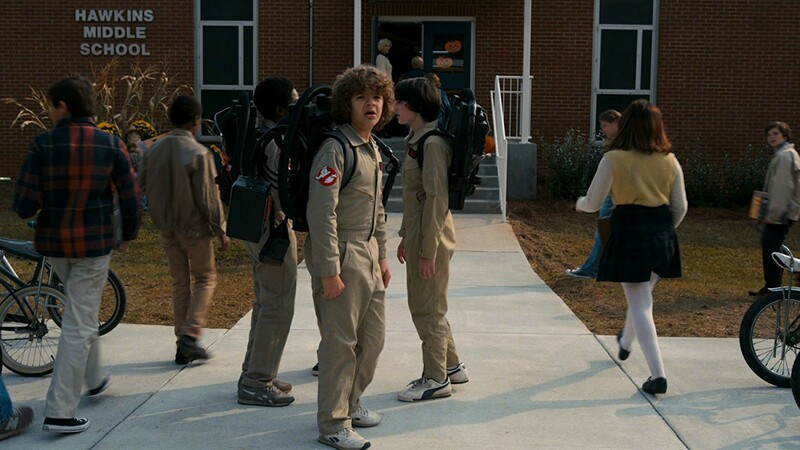 We are officially two weeks away from the premiere of the second season of Stranger Things, which will hit Netflix just in time for some Halloween streaming. Good thing, too, because it looks spooky as hell. Might want to turn off the porch lights so trick-or-treaters don’t interfere with your binge sesh on this one. Praise Netflix for giving us two and a half minutes to hold us over, because these are going to be two long weeks. It starts out with what we already know from previous trailers: Eleven is back. She’s in the woods, and the boys might know she’s there, because she retrieves a stack of Eggo waffles from a box that looks like it was left out for her. Also, Will is still seeing terrifying, Upside Down-style things. “On Halloween night, Will saw, uh… a shadow,” Mike says. The shadow is giant fingers or tentacles or something coming from the sky. Whatever it is, it looks bigger and scarier than the first season’s Demogorgon, but Netflix already told us to expect a bigger, badder monster this time around. We then see Hopper telling Will’s mom, Joyce, “These are not nightmares. It’s happening. And it all leads back here,” as the camera cuts to an aerial view of the lab where Eleven was tested. Honestly, how is that place still standing after everything that went down last season, though? So many questions. Next, Joyce is talking to doctors while Will sits in the hallway of a hospital. “This thing. You said it was all in his head. And what have you done? Nothing,” she says, then yells, “What is wrong with my boy?! Cut to Eleven racing through the woods. She is running with purpose. It looks like something’s chasing her until she uses her mind powers to unlock a door and break into a house. It kind of looks like Will’s house, but when the door flies open and reveals her standing there, her face does not say, “I’m here to be reunited with my buddies.” Fam, she is out for revenge blood. Then the entire last minute is basically a montage of terrifying scenes of the monster and scientists and doctors and all the characters talking about how the world is ending, so yeah, we think it’s probably safe to assume this season is going to be intense. There’s also guns and yelling, and everyone is in the Upside Down at one point. Gah, this is going to be a lot to take in. Buckle up, fans. Season 2 is clearly going to be a wild ride.